Cody Willoughby | Miami Valley Today ASL instructor Sarah Bensman teaches vocabulary to fourth, fifth, and sixth graders at the ASL Club Meeting on Tuesday at Piqua Central Intermediate School. Cody Willoughby | Miami Valley Today ASL instructor Sarah Bensman teaches new vocabulary to fourth, fifth, and sixth graders at the ASL Club Meeting on Tuesday at Piqua Central Intermediate. Cody Willoughby | Miami Valley Today ASL instructor Sarah Bensman and social studies teacher Nate Olmer lead fourth, fifth, and sixth graders through a vocabulary board game during ASL Club at Piqua Central Intermediate. 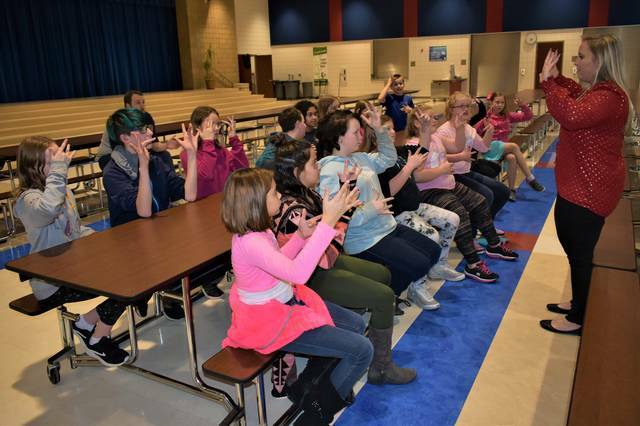 PIQUA — Fourth, fifth, and sixth graders at Piqua Central Intermediate School (PCIS) are learning to communicate without saying a word, thanks to the school’s ongoing American Sign Language (ASL) Club. The program, which runs November through April, is free to interested students. The club began during the 2017-18 school year, due to a joint effort between Sarah Bensman, who teaches ASL at Piqua High School, and PCIS social studies teacher Nate Olmer. Bensman meets with participating students for one hour after school on the first and third Tuesdays of each month in the commons. Together, the group learns sets of related words and play follow-up games to reinforce the vocabulary. “I do categories like family, food, animals, colors, and other things I can get enough vocabulary into one section that’s relevant to what they’re doing,” Bensman said. “My favorite thing about the program is she really makes sure you understand, and you get to learn how some people live every single day,” said sixth grader Julia Thompson. Bensman insists her goal is to continue spreading the exposure of the program to younger students, so that it will grow at the high school in years to come. “Giving this program as much exposure as possible to the kids over here is important to me. There’s a lot of people even in the school system that have no idea what I do,” Bensman said. Regular club sessions will run through Tuesday, April 16, at PCIS. New participants are welcome at any time. https://www.dailycall.com/wp-content/uploads/sites/30/2019/02/web1_ASLClub1-WEB.jpgCody Willoughby | Miami Valley Today ASL instructor Sarah Bensman teaches vocabulary to fourth, fifth, and sixth graders at the ASL Club Meeting on Tuesday at Piqua Central Intermediate School. Cody Willoughby | Miami Valley Today ASL instructor Sarah Bensman teaches new vocabulary to fourth, fifth, and sixth graders at the ASL Club Meeting on Tuesday at Piqua Central Intermediate. https://www.dailycall.com/wp-content/uploads/sites/30/2019/02/web1_ASLClub2-WEB.jpgCody Willoughby | Miami Valley Today ASL instructor Sarah Bensman and social studies teacher Nate Olmer lead fourth, fifth, and sixth graders through a vocabulary board game during ASL Club at Piqua Central Intermediate. 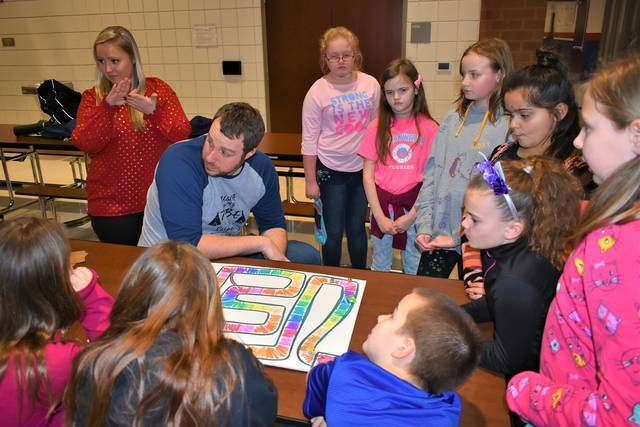 https://www.dailycall.com/wp-content/uploads/sites/30/2019/02/web1_ASLClub2.jpgCody Willoughby | Miami Valley Today ASL instructor Sarah Bensman and social studies teacher Nate Olmer lead fourth, fifth, and sixth graders through a vocabulary board game during ASL Club at Piqua Central Intermediate.